Women of Courage - Children's Advocacy Centers of Texas, Inc. The mission of the Women of Courage Committee is to serve as ambassadors for children victimized by abuse through increasing community awareness, promoting prevention, and financially strengthening the coordinated efforts of Children’s Advocacy Centers™ of Texas, Inc. (CACTX) and the local children’s advocacy centers (CACs) it supports. TO JOIN WOMEN OF COURAGE, CLICK HERE. Join us, as we celebrate the work being done across the state on behalf of Texas children through the network of CACs. Benefiting Children's Advocacy Centers of Texas, this ladies luncheon unites the voice, influence, and giving spirit of Texas women to achieve out ultimate goal of breaking the cycle of abuse for Texas children. View photos from the 2019 Women of Courage Luncheon here. Based on a 2015 Women of Courage grant award to Alliance For Children, the CAC serving Tarrant County, My Safe Space: A Room Makeover Project provides funding for CACs to transform spaces in which children impacted by trauma can begin their healing. In most cases, these children are going back to the home in which the abuse occurred. This space may have been violated by the perpetrator of their abuse, or may have been a part of investigative actions which cause furniture to be taken for the purpose of evidence collection in the criminal investigation. Women of Courage My Safe Space funding is available to all 71 CACs in Texas and more than half of the CACs participated in the inaugural year. 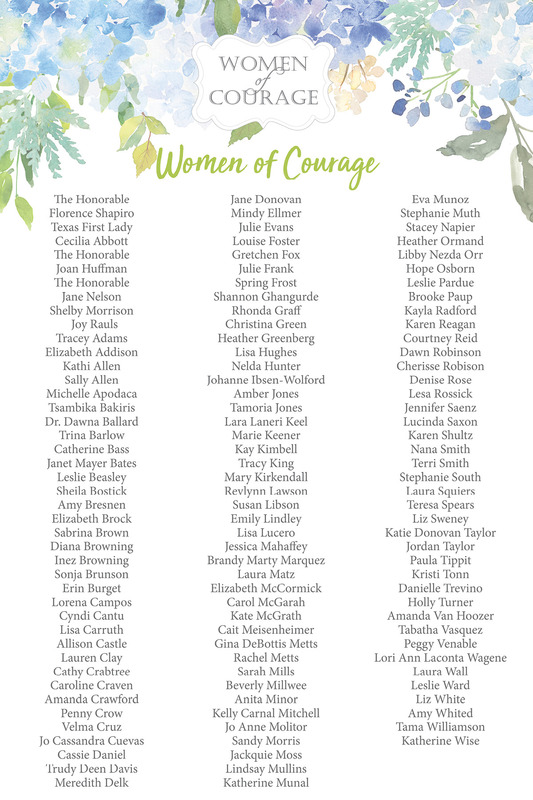 As the Women of Courage membership grows, the reach of the My Safe Space grant will increase the number of rooms being made over for more children throughout the state. Whether it’s a lamp, new bedding, an area rug, curtain treatments, throw pillows, or painting the walls, these room makeovers are a simple yet powerful act of creating a positive and safe new environment for child victims. In an effort to give abused children a public voice, Women of Courage filmed our very own Storytelling Project, a community awareness initiative to confront the issue and ignite visibility and awareness to openly talk about child sexual abuse. View the full video at the Women of Courage Story Telling page from CACTX on Vimeo.